The Supernova Organic Blend was blended and roasted for you by Kickapoo Coffee Roasters. This coffee is a custom blend of coffees from Mexico and Peru. Simple and straightforward, this coffee is intended to appeal to a wide audience of coffee lovers. We love this dark roast for its notes of baker's chocolate and smoke that creates a rich, bold cup. Great! One of our favorites from Mistobox. Can't really complain about anything - wasn't overly bitter, good dark roast with good balance of smoky chocolate. Very dark, surprisingly strong coffee. It will take some getting used to. I love a good darker roast every so often, this one was incredibly smooth, yet bold, with some sweeter notes as it cooled. I loved this coffee! Dark, flavorful, bold. Perfect for my first shipment! Very good. Not as bold as I thought ti would be, but still a winner. This coffee is rich and flavorful. It is smooth and does not have that bitterness to it. Very good bold, strong cup of coffee. Very nice. Smooth. Enjoyable way to start the day! Solid coffee. Deep, bold flavor, but not overly complex. I love the chocolate undertone and the dark roast. This one also has a low acidity that I love. Great coffee with great flavor. Loving it so far. A bit strong for my taste, but a great brew for making lattes and such. This is my second favorite coffee that you sent me so far! Loved it! Did not like this one. Much too light. Looking for darker, earthier taste with more full mouth feel. So far, we've liked the Velo French Roast the best. Let's try an expresso for the next choice if there's one you like. If not, maybe another French Roast. I prefer a dark dark roast that overwhelms. This comes close. Arrived very roasted to the point of being burned. Acrid, charcoal taste. Too smoky / burnt. The burnt French roast flavor dominates this, overpowering anything else that might be hiding underneath. Worst one sent thus far. I like this coffee and I also like the fact that it’s solar powered-which is unrelated to the coffee of course but if there are more coffees that are solar powered based I’d love to try them too! This is good. Great flavor. Able to enjoy with or without milk. Awesome, not as dark as deep space, more chocolate than smoke. Sweet cup. It was ok but had a very simple flavor profile. I jut got this one and it’s great. Wow super toasty. Love it. We were on the 4/5 star fence with this one. The last several coffees that Connor has sent has have been very, very good, but we decided that this was our favorite. I've used this in my espresso machine and also with my Chemex and am getting a nice body with a the smokiness and chocolate tones noticed. Overall a great cup of coffee. The first smell of this coffees was heavenly. The smokiness comes right through. The taste is bold and strong with a hint of chocolate. 180 degree filtered water. Pour over. Mild taste. Nice and balanced. Would like to try something more fruity next time. This blend has a very smooth overall taste. I love that it is a dark roast that isn't overwhelming in the bitterness. As the coffee cools a little from initial pour, more of the flavors start to come out. This is producing an amazing effect where each sip is slightly different, unraveling layers as I drink it. And they are all flavors that I love, from the slight smokiness to the bitter chocolate flavors. Not much in the fruitiness or the nuttiness, which is a preference of mine. Excellent taste and body. Very good. Not sure what's up with us even receiving this coffee – this is the total opposite of our preferences. It's super dark and oily, and way too roasty. I really enjoyed this coffee. Nice dark, oily beans. Smooth and easy grinding. The taste was bold and smoky, but without the bitterness. Excellent overall. My wife liked this much better than I did. Too dark for me and not enough character notes. This coffee had the best and most flavor of any I've received so far. Loved the rich flavors & aromas of Baker's chocolate & smoke. Yum! Was ok, a little on the sour side. LOVE IT! Roasted short of burnt, with bold flavor and nice aftertaste. A winner! Delicious and complex! Love it! 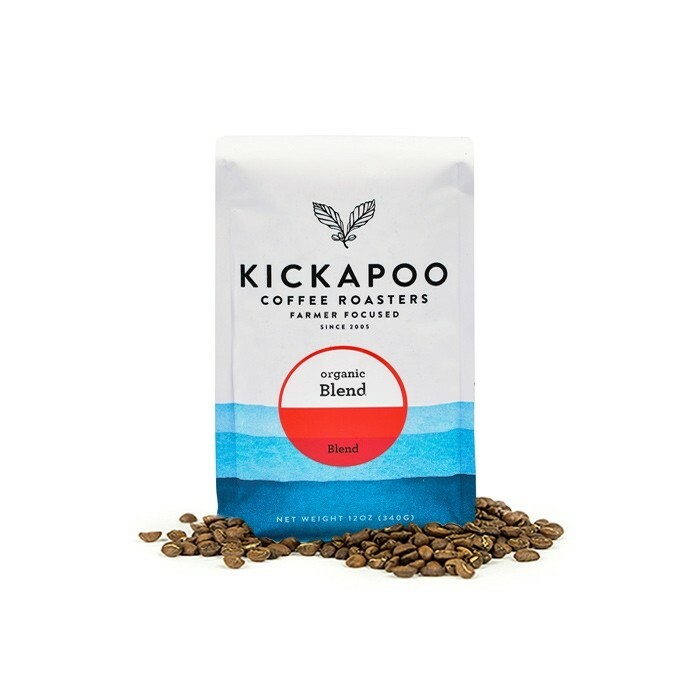 Love Kickapoo coffees. Great flavor, dark and complex. This was a good coffee, but it didn't seem to have anything that stood out for me. Very smooth though, which was nice. This practically tastes like any other blend. It was alright, but super oily beans. I love how rich this coffee tastes, it's a very bold blend. Very rich and bold. We really love this dark roast blend. You can absolutely smell and tast the chocolate, smokey flavor. Another win for Kickapoo Coffee Roasters and Mistobox! A bit too smoky for my liking. I like the color and oily finish on top but the smoky flavor adds a bitter bite that I can do without. I did enjoy this roast but I prefer a dark and oily roast that has more of a woody/nutty tone than the smoke. It cheapened the overall flavor. My kind of coffee here!! Dark roasted beans with the oils still glistening on them. Bold, hearty flavored coffee!! Definitely my favorite so far of the ones I've been sent. Wonderfully smoky and strong but balanced. 2 1/2 stars cold though. Very VERY good. Rich and smooth. Lots of bold flavor. It leaves a great after-taste. Not as bold as I might usually drink, but still has a nice bite upon drinking. Very smooth with the chocolate notes. Very good! Smooth yet dark roast. I wish it had a little more nuanced profile. Really like this. Reminds me of an old diner cup of coffee. Great, deep flavor and perfect when just black. This is very good - smooth and enjoyable to drink. I wish it had a little stronger flavor profile. Great smell, smooth, solid coffee choice. I like the oiliness of the beans and the dark color. The taste didn't exactly match the smell, but it's a great cup regardless. Little disappointed with the 11oz thing. I thought this was a nice coffee but I didn't find it interesting or noteworthy. We liked this coffee. Some have said it was too smoky. We didn't feel like it was too smoky. It was a subtle smoky that was a nice finish. We really likes the chocolate notes as well. Wonderful coffee. Smelled amazing through the box! Very roasty and bold. I would make this a regular in my morning coffee rotation. I like this one a lot, nice and dark but not bitter. At first I wasn't totally excited about the rich chocolate taste but I warmed up to it. Perhaps a little too dark for my tastes after all. Wasn't a huge huge fan! I think the description of "simple and straightforward" that was used to describe this coffee is pretty spot on. The most obvious note for me was definitely smoke. I could taste it full blast on the finish, and the aroma left a lingering smoky scent as well the longer I sat drinking it. It was bold, but not overwhelming, which for me is good. I would have liked to taste more than just the smoke at times, but maybe I just need more time with it (or other coffees in general). Overall a good coffee though. This blend is just about perfect! If the smoky just toned down one notch (I'm super picky) it literally would be the best cup of coffee I've had in a very very long time! I hated this coffee. If I liked Starbucks I would not have a Mistobox subscription. These are better quality beans I'm sure, but the roasty aftertaste is the same and lingers unpleasantly. I used to drink coffee like this, but my palette has matured and I would only drink coffee like this if I didn't know any better.